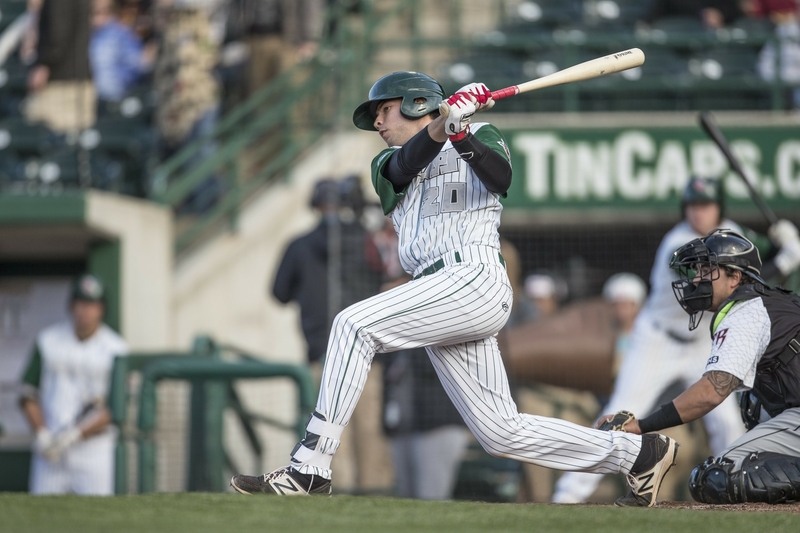 The Fort Wayne TinCaps swept the latest Midwest League Player of the Week awards, with third baseman Hudson Potts and RHP Lake Bachar respectively being named the league’s top offensive player and pitcher for the period of August 14-20. In seven games during that stretch, Potts batted .500 (14-for-28) with two homers, one double, two walks, seven runs scored, and six runs batted in. He had five multi-hit games, including three three-hit games. The San Diego Padres prospect is batting .248 with 15 homers, 19 doubles and 53 RBI in 113 games with the TinCaps this season. Bachar was perfect in his lone start last week, against the South Bend Cubs on Thursday. He struck out seven batters in seven perfect innings before being taken out of the game because of his pitch count. (He suffered a shoulder injury in the spring.) The game ended up being a one-hitter for the TinCaps, with South Bend’s only hit coming off reliever Jose Galindo with two outs in the bottom of the 9th inning. Bachar is 3-0 with a 4.29 ERA, 20 strikeouts and four walks in 21 innings (four games/three starts) for the TinCaps this season. A 2017 third-rounder out of the University of Houston, Wong, 21, began his week with an 0-for-3 performance before rattling off multiple hits in three straight games for the Loons during which he tallied 10 RBI, most among Top 30 backstops. By batting .471 last week, Wong raised his season average from .143 to .227. In addition to his .227 batting average, Wong has two homers, four doubles and 13 RBI in 19 games with the Loons this season. This entry was posted in Fort Wayne TinCaps, Great Lakes Loons, Midwest League, South Bend Silver Hawks. Bookmark the permalink.